This post is running a little behind as I’ve been swamped with end of semester projects. One down, two to go. Next week’s post might get impacted as well. My last two articles (one, two), part of the November RPG blog carnival, talked about the unexpected in Void Jump travel. In this article I want to discuss some more details about Void travel in my game and the mechanics that will be used. Or at least what I am considering for a first pass. In my universe, Void travel cannot start or stop anywhere. If you are too close to a large mass, the gravitational field of that object prevents void jumping. This was somewhat inspired by Larry Niven’s hyperspace. I liked the idea of having to worry about the large masses that you are traveling by. Unlike Niven’s hyperspace, getting too close doesn’t cause anything bad to happen, it just bounces you back into real space or prevents you from initiating a Void jump at all. Of course if the object is close, directly ahead, and you’re moving fast, things could get scary. This has a couple of implications for FTL travel. First, you have to get away from everything. I have an exact forumulation for it but for a solar sized star, you need to get about 4 AU away from the star before you can jump. Starting at a planet about 1 AU away, it takes abut 84 hours of acceleration at 1g to get out that far. This means that at a minimum, if everything is aligned properly and everything works, a single insterstellar jump will take about seven days (assuming a 24 hour day). Next, it means you only have to be accurate in your direction vector enough to hit that sphere around your target star where Void travel doesn’t work. As long as you’re lined up well enough, you’ll drop out of the Void when you hit that gravity well. This places an upper limit on how accurate you need to be. Now, the question is, can you get out of the Void on your own or do you have to hit one of these gravity wells to come out of the Void? I’m leaning toward the following combination. You can get out on your own, but it’s much harder than being pulled out naturally by hitting a gravity well. In this scenario, you want to try to hit the target gravity well when you can. This also means that locations close to the mass source (star or large planet) are “shielded” by the “no jump zone”. Any arriving ship or fleet has to arrive outside that zone so there will be advanced warning before they get to their destination (at least if anyone is looking). Another constraint is that nothing is ever in the same place twice. Planets orbit their stars which are orbiting the galactic center and moving relative to each other. This means that no two jumps are ever exactly the same. A jump from one planet to another, repeated just a few weeks later, means that both the start point and the destination as moved. It won’t be by much, but if you remember from my last article, even a little bit of error can result in a huge wrong location. Figuring out where you need to go is easy, determining if you are actually going there is another story. The problem is the same as the one above, everything is moving. There is not really an absolute reference frame. The problem is that you don’t just need to know your postion relative to the star your leaving but relative to all the stars in the sector. And it’s not really the position that matters but rather your velocity vector. How are you moving relative to all of these objects? And how do you determine this direction down to arcsecond (or sub arc second) accuracy? This can be overcome by the fact that you are moving quite a bit to get out of the gravity well. As you move along your path, nearby stars will appear to move relative to more distant ones. This is called parallax. By measuring how much each of the stars move, and which direction they move, you can determine your vector in space relative to your departure and destination star. There are some things to remember when trying to measure parallax. First, you have to move quite a ways to measure any shift at all in stars; they are really far away. Second, when you first start out, you’re not moving very fast so you don’t move very much between measurements. This means that the more accurate of a measurement you need, the longer it is going to take as you need to have larger and larger baselines to measure small parallax angles. You get these longer baselines by waiting longer and by accellerating so you’re moving faster and covering these distances faster. What is the Jump Process? Given all of this, what does a typical Void jump look like in game. First, the astrogator computes the jump vector. For this he needs to know the time of departure. Plus or minus a few hours doesn’t make much difference. This takes about an hour of time on the ship’s computer or could be requested from a central astrogation computer on the system’s data network if it exists. Next the ship points in the general direction of the target system and begins accelerating. Images are taken of the stars being measured for parallax. As the ship continues to accelerate and covers more distance, new pictures are taken and the parallax measurements are made. From this the course can be adjusted to make it more accurate. This is repeated until the course is accurate enough. 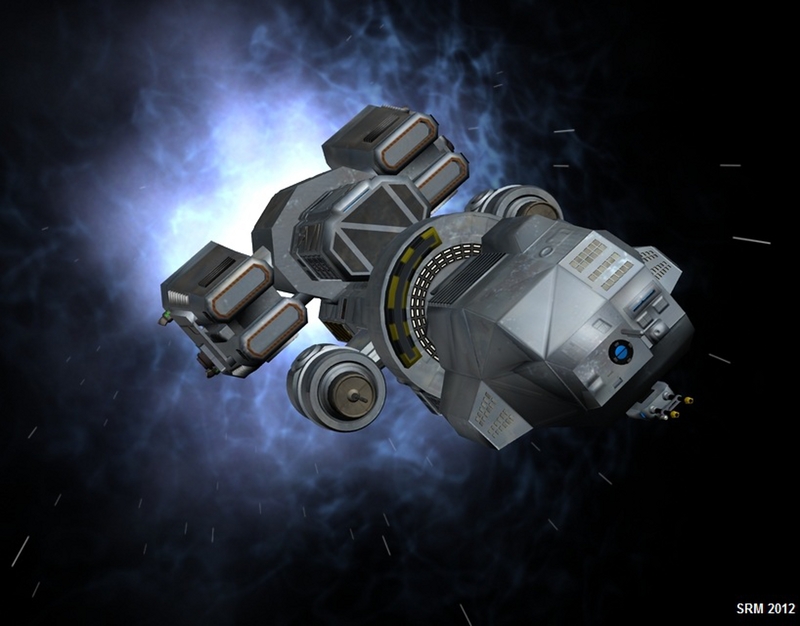 Once the ship is lined up and the minimum jump distance is reached, the ship can engage whatever technology enables the jump and shifts to the Void, makes the trip, and emerges in the destination system. At this point more standard navigation techniquies can be used to decelerate and travel to the destination system. You may have noticed that I kind of glossed over actually making the jump. That is going to depend on the setting. Star Frontiers does it by hitting 1% the speed of light (of course that begs the question, 1% of c relative to what?). For my world/game, the abilty to enter the Void is controlled by a “Jump Field Generator”. When you want to enter the Void, you turn this device on and it envelops the ship in a field that allows the ship to shift into the Void and make the jump. Turning it off takes you out of the Void. This really depends on the setting. How fast can the ships accelerate? What is the minimum jump distance? How long does it take to line up the ship? If you want to use this idea, you’ll have to answer that for your own setting. I’ll give you my answers. How fast can ships accelerate? For my setting, there is no artifical gravity. Thus to get simulated gravity on a ship it has to accelerate. But you also can’t accelerate too quickly or everyone gets squished. By default, ships tend to travel by accelerating and decelerating at one standard gravity which in my setting is defined as 10 m/s/s for simplicity. This means that accelerations are relatively low and it takes time to get from place to place. What is the minimum jump distance? For my setting, I’ve decided that the local gravitational acceleration (from everything smaller than the galaxy itself) has to be less than some specific value which I don’t remember off the top of my head as I’m writing this. For a star like the sun, this distance works out to something like 4.05 AU. At one standard gravity of acceleration, it takes about 84 hours to go from a planet at 1 AU out to the jump distance. This sets a minimum time for a jump. How long does it take to line up the ship? I’ve thought a bit about this but I’m going to invoke a bit of handwavium here toward the end for the fine details. There are several factors that go into it. The first question is how accurate of a parallax angle can you measure. Modern systems dediated to this can measure parallaxes of 10 micro arcseconds with lots of data on a 2 AU baseline (diamter of the Earth’s orbit) over five years. So it is reasonable that the ships should be able to achieve 10 mili-arcsecond accruacy (1000x worse) on the same baseline. After all, they should have at least equivalent sized telescopes and detectors. They just lack the time frame. So we should be able to measure o.o1 arcsecond parallaxes on a 2AU baseline or 0.1 arcsec parallaxes on a 0.2AU baseline. The next question is how big of a target are we trying to hit. Assuming you have to hit the “no jump zone” around a solar sized star, that target is a direct function of the distance. For a star 5 light years away, that 4 AU radius target corresponds to a direction accuracy of 2.6 arc seconds. So if we can measure 0.1 arcseconds in 0.2 AU of travel, let’s assume that we should be able to get our course vector accurate to 2.6 arcseconds in about 0.4 AU (0.2 AU to get the first vector, adjust, and 0.2 AU to verify). Now a 10 ly jump requires an accuracy of 1.3 arcseconds. The question is, how long should this take to dial in the desired accuracy? I’m fond of inverse square laws so I’d say that double the acuracy requires 4 times the distance. That means you have to travel 1.6 AU to get enough measurements and course corrections to achieve the desired accuracy. Traveling 1.6 AU from rest requires about 60 hours. Here’s where I will apply the handwavium quite liberally. I could easily pick some numbers and justify the accuracy needed to achieve a jump and compute the travel time exactly needed to achieve that accuracy for a given distance. And I could even provide the forumlas. But it would be kind of messy. However, I want something quick and simple. I could present the data in a table to look up. And I might do that as a later optional rule for those that want more realistic values. So a jump of one to three light years would take 10 hours to line up. A five light year jump would take 25 hours, and a 10 light year jump would take 100 hours. That was a very long winded explaination for what in the end is actually a simple result. If you want to make a Void Jump for distance of 9 light years or less, it takes 80 hours (notice I rounded it down to 80 hours from the 84 I was quoting above) to get out to the minimum jump distance at which point you are lined up and can make the jump. If your want to make a Void Jump for a distance of greater than 9 light years, it takes the number of light years squared in hours to get the ship lined up accurately enough. At which point you can safely make the jump. You’re starting further out in the system, maybe already beyond the minimum jump distance. You get attacked or encounter something and have to maneuver while getting lined up. Now you’re all messed up and you have to start over. What if you accelerate at a higher (or lower) rate? What if you don’t spend enough time lining up? Are there any other variations that come to mind? Are there any concepts that I should have explained better? Is there something I overlooked? Let me know in the comments below? The only thing that has been overlooked is some discussion of how increased depth of gravity well (i.e. a bigger mass) affects the size of the limits. Every example that you’ve offered refers to a Sol-sized star, but we know that there are an awful lot of stars that are both bigger and smaller – and that the size of a star also varies enormously, flattening but enlarging the gravity well. I think this aspect of your system needs some further expansion. Yes, I didn’t explicitly call it out in the article but my intention is to provide, probably as an optional rule, exactly how to modify the distance from the star as well as the accuracy needed for the destination based on the stellar type. A smaller star, by far the more numerous in the galaxy has a smaller well and is easier to jump from. At the same time, this means it presents a smaller target if trying to hit the “no jump zone” and requires longer to line up on the required accuracy. This just described a simple baseline that could be used to simplify play if the added complexity wasn’t desired.